When it comes to things that start with x, you could search for a long time and not come up with much. They are very rare. That’s why these cards have the three most common words that begin with x, as well as five words that have an x in them. At least this will give kids an opportunity to see and pronounce the letter x in several ways. 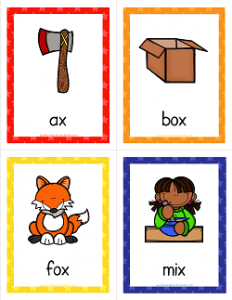 The words are: ax, box, fox, mix, six, x-ray fish, x-ray and xylophone.